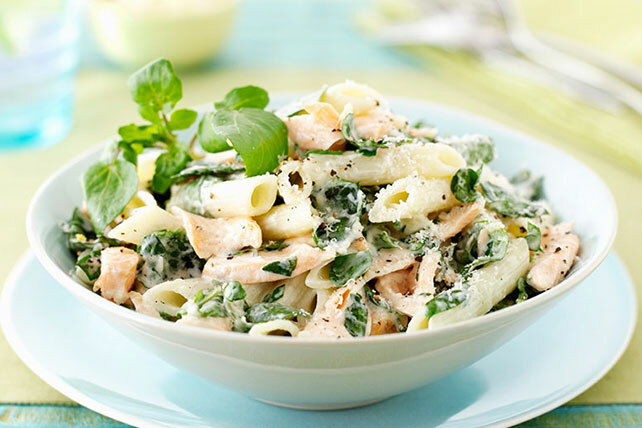 Our fabulous Penne with Salmon and Watercress recipe is easy and delicious. With only 20 minutes of prep and some fresh watercress, you can turn pantry staples into a company's-coming pasta toss! Cook pasta in large skillet as directed on package, omitting salt. Drain pasta, set aside. Add cream cheese and broth to skillet, cook 2 min. or until cream cheese is completely melted, stirring frequently. Stir in salmon and lemon juice. Add pasta and watercress; cook an additional 1 to 2 min. or until heated through. Transfer to platter; sprinkle with pepper. Sprinkle with 2 tsp. grated lemon zest and 2 Tbsp. Kraft 100% Parmesan Aged Grated Cheese.